When it comes to serving one’s state and nation, men and women in uniform know what it takes to protect lives and property. But working quietly behind the scenes, civilian contractors often provide key pieces to enabling that service. Among those contributing to the nation’s defense through their own special skills are the employees of Pavers Inc. They don’t wear uniforms, but they recently took on a project to keep those who do flying — a key component to National Guard response in times of natural disaster. When the Kansas National Guard was dealing with the rundown remnants of a World War II-era hangar apron, Pavers stood ready to accept the mission. The family-owned business, which was originally known as Wilson Constructors Inc., has been focused on concrete work for more than 60 years. Since 1992 Pavers Inc. moved into municipal and highway contracting, and its skill set now includes concrete pavement, curb and gutter work and site work such as demolition, grading, treated bases and dirt subgrade. The company also performs a considerable amount of repair work, including pavement patching, dowel bar retrofitting, partial depth patching and joint sealing. The latter repair work, along with an extensive amount of concrete work, is what brought Pavers to the Kansas National Guard project in Salina, Kan. The mission: Overhaul a 1,000-by-300-ft apron at Army Aviation Support Facility No. 2 that didn’t drain properly. Pavers needed to mill 6 in. of old asphalt and concrete and replace it with a fresh concrete overlay. It’s a mission in which Pavers is well-experienced, says Neal Saskowski, vice president of Pavers. And the experience isn’t just tied to the company. Saskowski himself has spent 32 years with Pavers, working his way from a general laborer up to his current position as vice president. In that time, he’s seen more than his fair share of patching projects. “Conservatively, we have done more than 100,000 sq yds of pavement patching in the last 15 years,” he says. On average, those jobs range from about 2,000 to 10,000 sq yds. That breaks down to 5,000 to 10,000 holes drilled for each project. One might say, Pavers has a “hole” lot of experience in the drilling arena. Over the years, Pavers’ projects have spanned the gamut, with a specialty focus on airport runways. Its work can be seen under airplane wheels throughout Kansas. On one end of the range is the 5-in. thick Runway 17-35 at Larned, Kan., where Pavers spent two days drilling thousands of holes for 3/4-in. dowels to secure the new pavement. Runway 17-35 in Herington, Kan., added an inch of pavement but with the same routine. 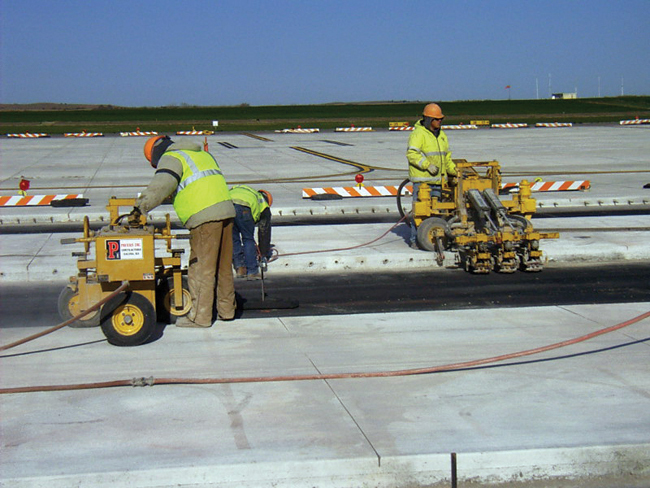 At Manhattan Regional Airport in Kansas, Pavers worked through the 7-in. thick runway with thousands of holes drilled and dowels bored in less than 48 hours. 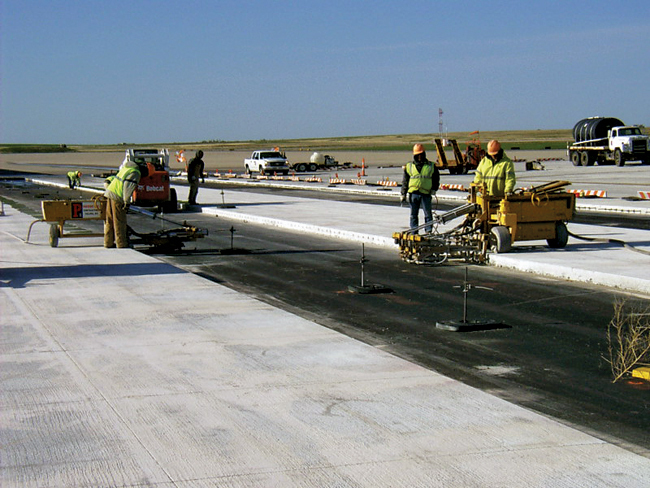 The Salina airport project for the National Guard had the company facing 2 ft of concrete and asphalt. The $1.9 million project was bid in the fall of 2010, and work began in November. The scope of the project meant sharing responsibilities with other contractors. One contractor did the milling for the top 6 in. of old concrete and asphalt that needed to come out, while another company was needed to install a 1-in. asphalt bond separation layer. A third major subcontractor provided traffic control, installing barriers around the work area and doing striping. Pavers focused on the drilling, doweling and concrete overlay. With more than six decades and thousands of holes under its belt, the company has learned to “work smarter, not harder,” relying on equipment that makes its jobs easier and more efficient. Among the equipment set it uses regularly is a spread of concrete drills. When Pavers started doing more highway patching jobs that involved drilling dowels into the edge of pavement, Saskowski said it started exploring options. The company did some research, but ultimately relied on what they saw working for others. Their observations, as well as Saskowski’s experience in the industry, led the crew to look into options from an Oklahoma-based company called E-Z Drill. When they learned the company’s equipment draws its power from compressed air, they were further intrigued. For Pavers Inc., air compressors were already a standard piece of equipment on the jobsite. With E-Z Drill’s fully pneumatic units, they merely needed to connect the air line and go. There were no concerns with maintaining hydraulic lines since the drills maneuvered and operated easily on air power. Since purchasing its first E-Z Drill in 1990, the pavement repair projects have increased significantly for Pavers. The company’s growing fleet of concrete drilling and doweling machines has kept pace with the workload. Now, 20 years after Pavers started using E-Z Drill equipment, it still proves a good fit. Saskowski rattles off the list of models the company has acquired to accomplish its many concrete jobs throughout Kansas. “Our fleet consists of three-gang, two-gang and single-gang slab rider drills. We also have three of the Model 210 on-grade drills, a Model 65B [on-grade drill] for small patch work and the vertical attachment to turn a 210 on-grade unit into a vertical drill,” Saskowski says. He also says they’re even still using that first drill they purchased in 1990. Two of those slab rider drills helped speed along the Kansas National Guard project to its April 2011 finish date. When Pavers set to work with a crew of about 15 to 18 employees to reconstruct the apron for the Guard, it divided the 300,000-sq-ft tarmac area near the hangar into 18, 16-ft-wide lanes, along with a few smaller areas. The company would need to drill more than 32,000 holes to complete the mission, with about 875 holes for each lane edge. Despite the big numbers, Saskowski says it was an average-sized project for the company. In just a day and a half, Pavers could finish four 1,000-ft-long edges, a very high productivity rate, according to Saskowski. He credited the speed to hard work and the ease of using the drilling equipment. The equipment’s reliability prevented any downtime in the process, which consisted of the crew pouring two lanes at a time, then coming back to drill the edges on both before moving to the next lanes. Having the right equipment and experience had Pavers Inc. completing the project in time — and getting the Kansas Guard fully operational again. Now the space is used for 10 helicopter pads for the Kansas Army National Guard’s UH-60 Black Hawk helicopters. A thicker concrete area allows heavier transport planes, such as the Guard’s KC-135 refueling stratotankers to be pulled close when they’re in the area. All together, the new area ensures the Guard can continue to train and respond as needed to successfully complete its mission. Lindsay Babb is the PR director at IRONCLAD Marketing, based in Fargo, N.D.